A while ago, I became dissatisfied with my rendition of tollhouse chocolate chip cookies. While at first I thought that was heresy, a quick internet search revealed I was far from alone. 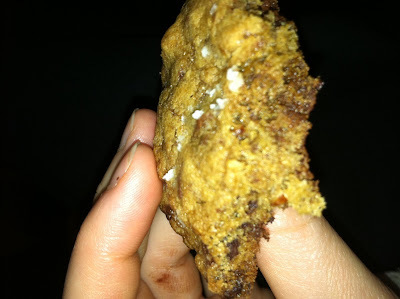 The recipe, of course, makes an amazing cookie, but perhaps because it is so simple and so good, it holds out the enticing prospect that there could be something just a little more complex that would be even better. Thus, like so many others, I have embarked on the quest for the perfect chocolate chip cookie. This isn't a sort of rigorous quest where I make lots of recipes at the same time and then taste them against one another, though. I bake at night and I bake largely to eat, so I don't have either the time or the inclination to produce more cookies than can be eaten in a single sitting. Instead, my quest simply involves making a different chocolate chip cookie recipe every time I want them, which is -- of course -- a lot. So I have baked the NY Times best cookie recipe, and I have made the various Levain bakery knock-off recipes, and I've baked various offerings from different blogs. Nothing has been quite right (though the Levain bakery knock-offs come close...I may have to do a post on those soon). Last week I decided to try again. I looked through a bunch of different recipes, but I needed something very fast and that matched up with the ingredients I have. And so I decided on one based on Dorrie Greenspan's Chocolate Chip Cookies. As it turns out, it became quite loosely based on this recipe, as I wanted to use muscavado sugar, rather than the light brown she calls for. (I have become obsessed with the dark caramelly taste of muscavado.) And then there were some measuring errors, and some problems finding chocolate chips, and some haste...So in the end, I had my very own cookie recipe. And my verdict was: Pretty good. Not better than tollhouse, and not good enough to end my quest, but a nice something different. These cookies are more caramelly, and have a darker, less sweet, more mature taste in general (I think the dark chocolate and muscavado are responsible). I would almost think of them as an entirely different breed: dark dark chocolate chip cookies. A note: these cookies taste and cook up MUCH better after the dough has been refrigerated for 24 hours. Ordinarily I wouldn't know that, because I think it is insanity to put together a whole bunch of delicious ingredients and then not taste the final product for 24 HOURS. And, in fact, I baked up a few batches of cookies right away. But then it got late, and I was tired, and I sort of liked the idea of having fresh baked cookies a few nights in a row, so I put the rest of the dough in the refrigerator and baked up a small batch for the next three days. I swear they got better every night. The texture changed from sort of "soft baked" on the first night, to a lovely mix of crispy on the bottom/just baked on the top, and the taste got just a bit sweeter and more vanilla-y. I don't know why, but there you have it. Sweetness Factor: 6; Indulgence Factor: 6; Difficulty Factor: 3; Chance We'll Make It Again: 7. Preheat oven to 375. Mix together the flour, salt, and baking soda in one bowl, set aside. In a mixer, beat the butter until it is smooth. Add the sugars, and beat for 2 to 3 minutes. Add the vanilla. Add the eggs, one at a time, beating for about 1 minutes after each egg addition. Add the flour mixture in three batches, beating on low speed for about twenty seconds after each addition. Add the chips and the nuts, and mix on low speed, or by hand, just until combined. 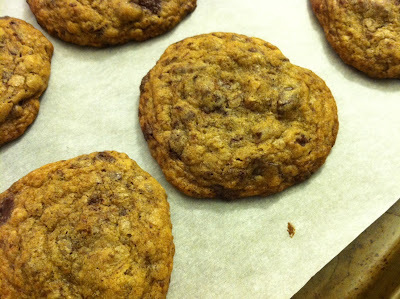 Drop batter by rounded teaspoon onto a cookie sheet. Bake for 8-10 minutes. Make one batch, to sate your hunger and curiosity. Put the rest of the batter in the refrigerator for 24 hours (or up to three days). Make the rest of the cookies as you desire. Having an excess of buttermilk leftover from the scone extravaganza, I decided to have a buttermilk themed meal. After some searching around, I settled on a buttermilk chocolate cookies and buttermilk sorbet. So it wouldn't be a meal, it would be dessert! Although this more savory option made the shortlist, and I hope to try it out soon. The sorbet is incredibly easy to make, but I thought it came out far too sweet, so I won't share the recipe until after I've had a chance to try it again with less (perhaps even half as much) sugar. If you're eager to get a head start, the recipe I used is here. As a side note, does anyone know the technical definition of sorbet? I had always thought it meant your frozen dessert did not start with a milk or cream base, but now I wonder if actually just refers to any frozen dessert that starts with a simple syrup base? I googled for a while, but found many conflicting answers. In any case, on to the main event. Chocolate buttermilk cookies. Somehow, in the past year or so, I have unlearned that one stick is a whole half cup of butter, and I have convinced myself that two sticks are required. It started with a chocolate peanut marble cake with caramel glaze, a bundt cake whose recipe instructed me to cream 1/2 a cup of butter. Perhaps because I have made so many bundt cakes that began with the instruction to cream two sticks up butter; I threw in two without paying much attention. I didn't realize what I had done until the cake was in the oven. The result was so delicious that the next time I made that cake I repeated it. It happened again a few weeks ago when I was making some gingerbread cupcakes. This time, I realized what I had done before I added any other ingredients, and in an uncharacteristic health conscious moment, I turned off the kitchenaid, pulled the butter out, and measured back in eight tablespoons (1/2 cup). Starting in on the buttermilk cookies, I read the recipe and thought to myself, "two sticks up butter? That seems like too much. Maybe I'll just use a stick and half and see what happens." Half way in to mixing the batter I started to worry the cookies would turn out too dry, so I decided to compensate for the reduced butter by adding a little bit of extra buttermilk. Needless to say, when I finished mixing up the batter I had something that was far mushier than your average cookie dough. It suddenly dawned on me what I had done. I pressed on, baking two trays worth of extra-butter, extra-buttermilk, chocolate cookies. They were fudgy and tasty, but I wasn't totally happy with their consistency, so I added an extra 1/4 cup of flour to the remainder to the batter before baking. The second batch were much more what I was I going for. They were still fudgy, but they didn't flatten out as much as the first batch had (compare those on the lower right of the cooling rack with those on the upper left). I served the cookies to a group of friends who came for dinner, and this audience proclaimed the mistake a success but agreed that the second batch had a slightly better consistency. Both batches, however, had a wonderful tangy-bitter flavor resulting form the combination of the dark chocolate (I used about half of a Trader Joe's Dark, 72%, pound plus bar). The recipe below doesn't include the extra butter or buttermilk, but if you are looking for cookies with an extra melt-in-your mouth factor, a few extra tablespoons of butter should do it! Sweetness Factor: 8; Indulgence Factor: 7; Difficulty Factor: 3; Chance We'll Make Them Again: 10. Preheat the oven to 350 and line two baking sheets with parchment. In a small bowl, whisk together the flour, baking soda, and salt. Set aside. Melt the butter (either in the microwave, stirring every twenty seconds, or in a small saucepan over low-medium heat). Transfer butter to a large bowl and whisk in the cocoa powder until dissolved. Whisk in the sugars and the vanilla. Whisk in the flour mixture. Whisk in the chopped chocolate. Using two spoons (or your hands), form the batter into 1-2 tablespoon sized dollops and space about 3 inches apart on the cookie sheet. Bake for ten minutes. Let cool for two minutes on the cookie sheet before transferring to a cooling rack.